All-on-Four Implant-Retained Dentures Will Change Your Outlook on Life! What if you could receive a full arch denture to completely transform your smile in just one office visit? 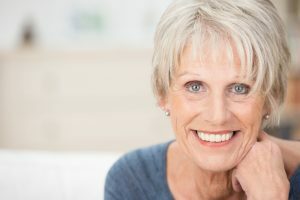 If you have recently undergone severe tooth loss, or are frustrated with wearing a traditional arch denture – we may have just what you need to improve your oral health and overall outlook on life! At Fresno Dental Studio – we are proud to offer All-on-Four implant-retained dentures. This revolutionary implant system can support a full arch denture with just four dental implants. Once the implants are strategically placed within your jawbone, in most cases, a customized denture can be attached in the same visit. Patients who are looking to avoid complex oral surgeries with an extensive healing period find All-on-Four dental implants to be highly beneficial. These implants are also recommended for patients with bone degeneration who are unable to qualify for traditional dental implants. If you have recently lost a significant amount of teeth and are looking for an effective and affordable option to replacing your teeth – we highly recommend considering All-on-Four dental implants. To learn more about this implant system, contact our Fresno, CA dental office today online or by calling (559) 297-1294. Tooth loss can be an embarrassing ordeal, but did you know that it can also cause severe and long-term damage to your oral and physical health? The moment tooth loss occurs, the soft and hard tissues within your mouth will slowly begin to atrophy, due to a lack of stimulation. Inside your jawbone are tiny nerves that are stimulated by your natural tooth roots. With each bite you take, these nerves stay engaged to promote healthy bone growth. However, once tooth loss occurs, these nerves no longer have teeth in place to keep the area healthy. If left unaddressed, tooth loss can lead to jaw pain, dental misalignment, TMJ disorder, difficulty eating healthy foods, and even facial structural changes. Who is a Good Candidate for All-on-Four Dental Implants? If you have recently lost a full arch of teeth in your upper or lower jaw, you may enjoy the benefits of All-on-Four dental implants and a customized implant-retained denture. We invite you to schedule a consultation with Dr. Denes at Fresno Dental Studio in Fresno, CA by calling us at (559) 297-1294.